I think I mentioned in one of my posts before Thanksgiving that I wanted to make something different this year for dessert VS the traditional pumpkin pie. Of course I couldn’t decide on just one thing so I compromised. I made the Pumpkin Spice Cake with Cream Cheese Frosting to satisfy my pumpkin tooth, and then to fulfill the pie opening in the line up I decided on an Apple Blackberry Pie. Now, I had never made pie before so I was quite nervous about this undertaking. I chose to make Apple Blackberry Pie because I wanted apple and Kevin prefers blackberry so WALA simple choice to me was to throw them in to party together, seemed logical to me. I was surprised how simple the process really was. I was expecting to stress out and struggle but it all went quite smoothly. Now I am excited to bake more pies! I hope the neighbors are ready!!! To prepare the pie crusts place the flour, salt, and sugar in a food processor and pulse a few times to combine. Add the butter and pulse until the mixture resembles coarse meal, about 10 seconds. Add the ice water slowly through the feed hole in the processor just until the dough holds together. Don’t process for more than 30 seconds. Turn the dough out onto a work surface. Divide in two. Place each half on a sheet of plastic wrap and flatten to form two discs. Wrap and refrigerate for at least an hour. Whisk together granulated sugar, cinnamon, flour, and salt in a large bowl. Add apples and blackberries and toss to combine. Pour filling into prepared pie crust and dot with butter. Preheat oven to 400 degrees F with the rack in the lowest position. Brush the rim of the crust with egg wash and top with second pie crust. Trim if necessary and pinch the edges together. 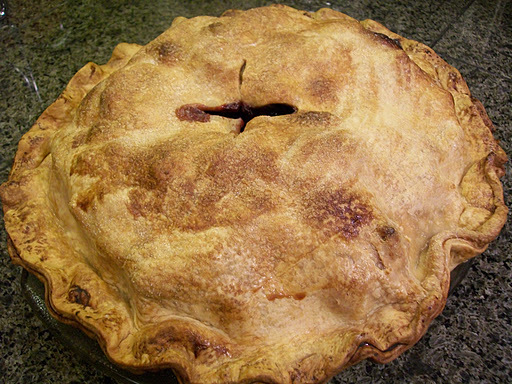 Cut a small X in the center of the pie crust and then brush with egg wash. Sprinkle with sanding sugar. Place pie in freezer for 30 minutes. Place pie on a baking sheet and bake for 20 minutes, or until crust is golden. Reduce heat to 350 degrees F and rotate the pie about halfway through baking. Bake about 1 hour and 45 minutes, until the juices are bubbling in the center and the crust is golden brown.